Australia Day, otherwise known as Foundation Day is celebrated in Australia on January 26 and it is an official public Australian Holiday. Enjoy a colorful day with firework displays,parades, air shows, boat races and lots of food so you can eat to your hearts content. It's the perfect day for a holiday party! Spend the time with the whole family and rejoice for January 26 marks the arrival of your great grandfathers to the land that has the biggest rock in the face of world. And watch out moms and dads, your name might be called by the prime minister himself for the Australian of the Year award. Now, wouldn’t it be nice for your dad to become Australia’s hero? Imagine the thrill of him getting an award and this wonderful honour! Why is January 26th called Foundation Day? It is called Foundation Day in honor of the day the First Fleet arrived in Botany Bay in the year 1788. This First Fleet consisted of 11 English ships and these ships carried 1400 passengers. It was the foundation of the English Colony that started there. Dance with the festivity and sing your lungs out, for today everything is possible. Join the stars in celebrating the Big Day Out and Australia Day Live Concert. Support the home cricket team at the Australian Tri-series. Be proud of your kangaroos, alligators, the Great Barrier Reef and the things that only Australia offers. Who knows, you might take your dad’s place of being Australia’s hero someday. Find coloring pages of these animals. Let the kids color and learn at the same time. There are some fun kids movies you can watch too. Be sure to serve some authentic Australian recipes for lunch, dinner and of course, dessert! Every day is a gift...be sure to celebrate it with your family! Australians all let us rejoice, For we are young and free; We’ve golden soil and wealth for toil; Our home is girt by sea; Our land abounds in nature’s gifts Of beauty rich and rare; In history’s page, let every stage Advance Australia Fair. In joyful strains then let us sing, Advance Australia Fair. Beneath our radiant Southern Cross We’ll toil with hearts and hands; To make this Commonwealth of ours Renowned of all the lands; For those who’ve come across the seas We’ve boundless plains to share; With courage let us all combine To Advance Australia Fair. In joyful strains then let us sing, Advance Australia Fair. Here are some great color ideas to use at your Australia Day party. 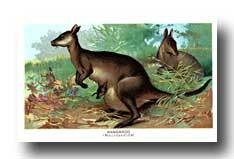 You can find lots of party supplies and Australian animal pictures to use as party decorations. The national colors of Australia are green and gold. I would have thought the colors were red,white and blue...just like ours here in the USA. When I saw the flag in the picture at the top of this page, I was positive they were red, white and blue. The national floral emblem of Australia is the Golden Wattle (Acacia pycnantha). 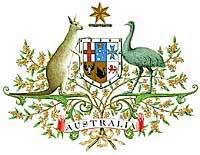 Did you know there are two Australian animals are on the Coat of Arms? What star constellation is on the Flag of Australia? What is football called in the Land Down Under? What people are Indigenous to Australia? What is the Great Barrier Reef? What is the name of a favorite snack in Australia? Only some of the answers to these questions are right here...the others you will have to look around this web page to find. An Emu is one of the animals on the Coat of Arms, The Southern Cross is the star Constellation. Soccer is football in the Land Down Under. The capitol city is named Canberra and the Great Barrier Reef is the world's largest Coral Reef. The picture of the Coat of Arms is below. What is the other animal on it? The national gemstone of Australia is the opal. Opals are very rare and they certainly are beautiful precious stones. Opals need certain conditions to form and these conditions are found in the Australian deserts. About 90% of the world's opals come from there. Black opals, white opals, crystal opals, and boulder opals come from different areas of the continent. Ancient Aborigines believed the sparkling stone was a gift from the sky. They believed a rainbow touched the earth and created the colors of the opals. Did you know the Great Barrier Reef is made up of over 3000 individual reef systems? It is one of the Seven Wonders of the World. This Reef runs along the Queensland coast from Bundaberg to Cape York. It is over1800 miles long and there are over 400 kinds of coral, 1500 species of tropical fish, over 200 types of birds, over 20 kinds of reptiles and you can even find some Giant Clams that are older than 120 years. The Great Barrier Reef is also a breeding area for humpback whales who migrate from the Antartic. You will also find some endangered species such as the Dugong (Sea Cow) and large Green Sea Turtle. What is Vegemite? Vegemite is a black spread made from brewer's yeast. It is one of the richest sources of B complex vitamins. It is usally eaten on biscuits, sandwiches and buttered toast. Invented by the Fred Walker Company in the early 1920's and this company was bought by Kraft sometime later. The recipe is still a secret and though Australians love it many visitors who taste it find it way too salty and strong a taste. When did you first learn about Vegemite...for me, it was a line in a song by an Australian band "Men At Work", the band from Downunder. The line was, "He just smiled and gave me a vegimite sandwich." Funny how, after all this time, I still remember that one line. If you want to teach your kids about the continental of Australia, why not do it with an Australia Day celebration? Learning can be fun and a kids holiday party is a great way to have fun. Check out party pages to find more holidays and Creative Party Ideas. Have a party celebrating the holiday of Australia Day with your kids.